We’d love your help. Let us know what’s wrong with this preview of A High Price to Pay by Cynthia Hamilton. Madeline’s dual professions as event coordinator and private investigator cross paths during the most lavish affair of her career—a weekend-long fortieth birthday extravaganza for the wife of a famous film director. A simple background check after the disappearance of precious family jewels quickly turns into a murder investigation, and before Madeline and Mike can put the Madeline’s dual professions as event coordinator and private investigator cross paths during the most lavish affair of her career—a weekend-long fortieth birthday extravaganza for the wife of a famous film director. A simple background check after the disappearance of precious family jewels quickly turns into a murder investigation, and before Madeline and Mike can put the pieces together, another body turns up. As the Santa Barbara police and sheriff’s departments search for clues, the Mad Dog P.I.’s use their own methods to untangle the crimes, discovering some unsavory truths behind the glittering façade of their clients. Adding to Madeline’s already overflowing plate, the D.A. informs her that Rick Yeoman, one of the men who had abducted her three years earlier, has been prematurely released from prison after cutting a deal with the Feds. Besides fearing reprisals from the man she helped to convict, his parole also triggers the reappearance of soulless Lionel Usherwood, lured out of his hideaway by the call of revenge. When Yeoman’s body surfaces in Lake Cachuma, Usherwood moves on to the next target: Madeline. A High Price to Pay is the second novel in the Madeline Dawkins series. To ask other readers questions about A High Price to Pay, please sign up. Thank you for this exciting murder mystery. The storyline kept me on edge and the characters were amazing. Maddie was fantastic in her solving the murders, especially her great footwork. I look forward to reading more of your work. Even though I figured out who did it immediately; this was a good story. A lot of unexpected situations came up that were interesting. The two M D's are likeable. Would have enjoyed more discussions over the case in the story. A High Price To Pay, the second installment in the Madeline Dawkins mystery series from the talented author Cynthia Hamilton, belies the curse of the sophomore slump. It grips the reader and conveys her/him on a strident pace through Madeline Dawkins’ graduation from her private investigator’s “internship,” as she transitions from her event planning career to fulltime work as a P.I. Her longtime friend, confidant, and occasional lover, Mike Delaney, remains beside her as her partner in the fledg A High Price To Pay, the second installment in the Madeline Dawkins mystery series from the talented author Cynthia Hamilton, belies the curse of the sophomore slump. It grips the reader and conveys her/him on a strident pace through Madeline Dawkins’ graduation from her private investigator’s “internship,” as she transitions from her event planning career to fulltime work as a P.I. Her longtime friend, confidant, and occasional lover, Mike Delaney, remains beside her as her partner in the fledgling P.I. firm, but as they embark on their own after gaining their licenses to practice, the sobering reappearance of an old and dangerous adversary blunts their enthusiasm. The release from prison of a psychopath against whom Madeline provided testimony, after he cuts a deal with the Feds to turn state’s evidence against his former boss, puts Madeline and Mike on guard. As Madeline nears completion of a year-long plan for a three-day party for a Hollywood diva, she and Mike keep one eye on the work and another over their shoulders. The plotting of A High Price To Pay is exquisite. The characters are depicted with rich depth and dimension. As in her other works, Cynthia Hamilton reveals an intelligence in her writing about human nature. There are no cardboard cutouts here to occupy space or meet a superficial need. Every character, however minor or tangential, is fully-drawn and consequential. This is a hallmark of Hamilton’s prose. She is an accomplished and gifted wordsmith. This book far exceeds the expectations of an ordinary whodunit. The characters, through their thoughts and actions, reveal reflections on human nature, insight into emotions and passions we all share. By the time the mystery is solved, we’ve learned far more than the murderer’s identity. In addition to the first Madeline Dawkins mystery, Spouse Trap, Cynthia Hamilton is the author of three previous novels and a memoir about her triumph over Lyme disease. I admire her talent for analyzing relationships, for weaving a plot around fascinating characters, and for teaching me about myself from what she reveals about us all. This is a thrill ride. Madeline was assaulted in the past and there is evidence that the person responsible for that assault is now coming after her again. He has already killed a man who gave information to the police. She is next on his list. He is tying up loose ends. Madeline is a newly licensed Private Investigator and she and her partner, Mike, are vigilant about trying to stay a few steps against the threat. At the same time Maddie is finishing up her last two giant events – a wedding and a This is a thrill ride. At the same time Maddie is finishing up her last two giant events – a wedding and a celebrity gala She has been an event planner while she was working on becoming a private investigator. And the two final events are very large parties. She is asked to investigate a jewel theft. The new client is a woman who is missing some very expensive jewels which were gifts from her late husband. There is monetary value as well as a great deal of sentiment attached to the jewels and it is important that they be found. Madeline and Mike are well defined characters. Each of them look at things from different perspectives and they complement one another well when they are working to solve a problem. The only thing I find irritating is the fact that Madeline seems to be unwilling at times to talk to someone who evidently cares very deeply for her. Sharing does not seem to be her strong point. The secondary characters are wonderful at adding texture and depth to the story. Ms Hamilton is an expert at creating atmosphere in a few phrases. The reader is given a picture and drawn into the scene quickly. There is danger and mystery involved. As the story moves forward, there is the realization that the villain who is after Maddie is waiting in the wings. And the jewel robbery and a couple of murders at a venue only add to the sense of trepidation. This is a very well written book. If you are a fan of mysteries and thrillers, this is a book you will find difficult to put down. I received this book from the author in the hope I would write a fair and honest review. All opinions are my own. Cynthia Hamilton does what many other authors do not do and that is she immerses herself into her work to make sure that she givers the readers the most accurate story possible. Hamilton wanted to write detective stories, so she took a detective course. She wanted to write about Guam so she immersed herself in the scenery and culture of Guam. She wanted to have her character take a martial arts class, so she took a martial arts class. You don't see this kind of dedication these days, and I admir Cynthia Hamilton does what many other authors do not do and that is she immerses herself into her work to make sure that she givers the readers the most accurate story possible. Hamilton wanted to write detective stories, so she took a detective course. She wanted to write about Guam so she immersed herself in the scenery and culture of Guam. She wanted to have her character take a martial arts class, so she took a martial arts class. You don't see this kind of dedication these days, and I admire that about Cynthia very much. Even Stephen King relied on Rocky Wood to do research The Shining's characters while he was writing Dr. Sleep. This alone should make you want to read Cynthia Hamilton. As For "A High Price To Pay," It is the second book in the Madeline Dawkins Series and follows up the excellently written "Spouse Trap." it begins with Madeline completing her internship from PI training and moving from an event planner to a full time Private Detective. Madeline still needs to finish off one last event that she has been planning for a full year and things get complicated when a madmen she helped put behind bars is released after striking a plea deal. My real rating is 3-1/2 stars, I rounded up. I found "A High Price To Pay" to be well-written, with decently believable characters, situations and dialogue. The 'mystery' was well-crafted: I did figure it out, early on, but I doubt most readers would catch all of the subtle clues, and will be surprised to discover who the killer was. There were two sets of murders. I cannot figure out why Ms. Hamilton thought the first, more thriller-style, to be a necessary part of this story. The book would have My real rating is 3-1/2 stars, I rounded up. There were two sets of murders. I cannot figure out why Ms. Hamilton thought the first, more thriller-style, to be a necessary part of this story. The book would have been better without it, and it only detracted from the plot. As the unnecessary murder was a holdover from what I imagine must be the first book in this series the author went into great detail about a previous story - so much detail that now I doubt I could read that book with much enjoyment (I don't plan to try) - and once again, to the detriment of the main storyline. I will, however, be on the lookout for future books. I whole-heartedly recommend this thrilling sequel to Spouse Trap by author, Cynthia Hamilton. I was throughly entertained and enthralled by this fast paced and clever tale, which had me guessing to the end. In this second book of the Madeline Dawkins series, Madeline has come into her own and she is on fire! This is an expertly woven story and the amazing cast of characters had me completely engaged. It is witty, intelligent and down-right FUN! This book truly showcases Ms Hamilton's gift for wri I whole-heartedly recommend this thrilling sequel to Spouse Trap by author, Cynthia Hamilton. I was throughly entertained and enthralled by this fast paced and clever tale, which had me guessing to the end. In this second book of the Madeline Dawkins series, Madeline has come into her own and she is on fire! This is an expertly woven story and the amazing cast of characters had me completely engaged. It is witty, intelligent and down-right FUN! 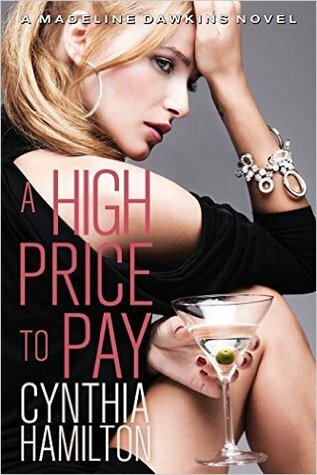 A high price to pay by Cynthia Hamilton is a great "who done it " with several antagonists. The story opens with Maddie and Mike completing a. 3 year apprenticeship as private investigators and Maddie is an event coordinator. From there things go awry rather quickly like missing jewels to 2 murders. Easy fun read. Now I am going to get Cynthia Hamiltons other books. wide vocabulary. I even learned a couple of new words. I enjoyed the second installment of the Madeline Dawkins series and would be inclined to read more about the characters. The mystery and the solving of it were satisfying; the writing of the emotions was a bit off but that may develop better with time. This is the second book in the Madeline Dawkins series, after "Spouse Trap," which I liked. This one? Not so much. I thought the first book had some problems, especially Madeline being all weepy and whiny. But the story was good. It was interesting as hell to see how it would all play out, even if you kind of knew she would ultimately prevail. I figured in the second novel she might be less invested in the plot – that is, less personally affected – therefore less weepy and whiny. Well, I was wrong. She’s still weepy and whiny. And even worse, so is the character of Cherie. It’s double the weep and whine! And the mystery – even set up as more of ‘who-done-it’ than the first one - is just less compelling. And the ‘why-done-it’ just doesn’t ring true. The who was just too easy to figure out. And usually with mysteries, I ain’t that smart. Which I actually prefer. The ‘carry-over’ part of the plot wasn’t all that interesting either. Mike was fleshed out a bit more, but he’s still too over-bearing. He just kind of hovers over her the entire novel. She’s a grown women, with not one but two careers. How many times does she have to prove to you she can take care of herself? It’s easy reading. I liked the character of Vivian, and I liked the details that went into the party-planning. Unfortunately the Cherie and Ross characters come off as ‘types’ as opposed to flesh and blood beings. Ultimately, I was expecting more from the author of Spouse Trap. But I would read the next installment if there is one. this was story was one that more than one crime occurring during a party.the other crimes were part of criminal crimes in the past.a surprise ending. A predictable plot, reasonably well narrated. Some of the non-essential distractions in the first half could have been avoided to ensure even pace, and earn greater appreciation. Very good story and I very much enjoyed it, but it wasn't riveting. I usually read a book in a day or two, but, I kept putting this one down, reading other books, then picking it back up again, reading some more, putting it down and reading other books again. This time I made a pledge with myself to finish it. At about 65% through the book, it started to pick up. By the simple process of elimination (after all, there were only four people that had the opportunity to commit the murder), I had alr Very good story and I very much enjoyed it, but it wasn't riveting. I usually read a book in a day or two, but, I kept putting this one down, reading other books, then picking it back up again, reading some more, putting it down and reading other books again. This time I made a pledge with myself to finish it. At about 65% through the book, it started to pick up. By the simple process of elimination (after all, there were only four people that had the opportunity to commit the murder), I had already figured out who did it, but a motive was still elusive , which motive did not appear till around 80% of the book, at which point it became riveting and I couldn't put it down. I look forward to reading more of Madeline Dawkins, but, I sincerely hope that the other books in this series move at a quicker pace and do not just mosey along till about two-thirds or three quarters of the way through the book and then all hell breaks loose. Book 2 was as good as number one. These books are so different in so many ways . I enjoy them. I have been writing since 2000, when a collection of bizarre physical problems forced me to find a creative outlet I could pursue from bed, if it came to that. Since then, I've written several novels and two memoirs. I love creating characters and setting them down in situations to see how they react. Most of my stories spring entirely from my overly-fertile imagination. My latest—Girl Trap—is the I have been writing since 2000, when a collection of bizarre physical problems forced me to find a creative outlet I could pursue from bed, if it came to that. Since then, I've written several novels and two memoirs. I love creating characters and setting them down in situations to see how they react. Most of my stories spring entirely from my overly-fertile imagination. My latest—Girl Trap—is the third book in the Madeline Dawkins series. I didn't start reading for pleasure until I was nineteen. Once I discovered the joy of stepping inside someone else's imagination, I was forever hooked. Because of the magic I experienced when I read, I believed writing was something I would never be capable of doing. It was only when I forgot that I couldn't write that I discovered that I actually could. I still read a lot - I always have multiple books going at once - and I'm still getting a thrill out of testing my characters' strenght. Both pursuits help me understand the complexities of life and my fellow human beings. It's my policy to only review books that I've really enjoyed, for a few reasons. If I'm not really taken with what I'm reading, I may not finish it. This falls under the "life is too short" philosophy. Because I have several books going at any time, some just drop off my radar. I would also feel uncomfortable giving a fellow author a bad rating; just because I didn't find it particularly enjoyable/interesting doesn't mean there's something inherently wrong with it. But you can be assured that I give a four or five-star ratings because the book was worthy of it in my eyes. On a professional note, I'm gearing up for the fourth installment of the Madeline Dawkins series, cooking up more trouble for the MDPI team. I have also started a series of blog posts here on Goodreads that tell The Story Behind the Story of books that I and follow authors have written. Please check back for updates on my progress!